Different ranked officers, as one call tell by the uniforms, walk the grounds at the RCMP Academy in the City of Regina, Saskatchewan. Officers in the red uniforms with their stetson hats are highest in command, while others are already on the force or still trying to complete their training. To complete the training regime at the RCMP Academy in the City of Regina in Saskatchewan, members must finish a 26 week program consisting of long hours of hard exercise, studying and strict discipline. After graduation, the officers can then start their new career protecting and serving the people of Canada. Visitors can explore the RCMP Heritage Centre and attend the Sargeant Major's Parade and Graduation ceremonies at the RCMP Academy. The heritage centre has become a very popular tourist attraction and is one worth seeing while in Regina. 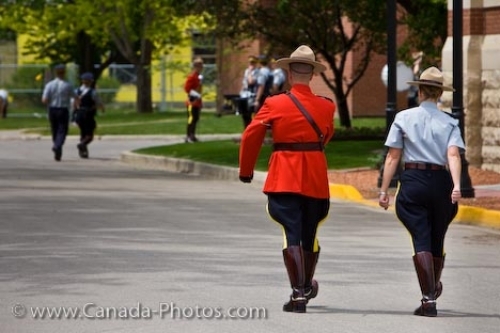 Picture of officers wandering the grounds at the RCMP Academy in the City of Regina, Saskatchewan in Canada. Members of the RCMP in uniform at the Academy in the City of Regina, Saskatchewan, Canada.